At More than a Pub Live! there was a great deal of talk about mutual support for one another. Aimee Evans, Project Manager at Plunkett, provides an in-depth round-up of the events actions and activities. “Starting out on your community pub journey isn’t always easy, but the consensus was clear – you’re not travelling on your own. Mark Newcombe, from the Craufurd Arms, served up a warm welcome chairing the day’s events as well as propping up the ‘pop-up pub’ with his daughter Emily. Both could be spotted sporting the famous Craufurd Arms merchandise (you wouldn’t believe how far this t-shirt travels.) Together with Gabriel and Mike from the Abingdon Arms, there was plenty of food for thought for anyone involved in Community Pubs. As our ‘Big Discussion’ and Guy Browning’s introduction got underway, there was agreement that there’s no one blueprint for a community pub. Involve your community, welcome others with an open door culture, pepper with thank- you’s and you could earn serious brownie points or, as Guy pointed out, fairy cakes. After all, it pays to remember that the cake bakers are just as valuable as the committee members who might be highly skilled in the more serious business of spreadsheets. We also heard refreshingly honest perspectives about when things don’t run as smoothly as expected. When there is a bump in the road, there’s learning to share and many valued the opportunity to meet, talk and lean on one another for support. After lunch, discussions continued to flow with Nathan Brown and Emily Dresner’s workshop ‘Tips on Tap’ around governance and succession planning. Encouraging members to become Directors by demystifying the roles and equipping them with understanding paves the way to succession success. An insightful and light-hearted round-table discussion with the Holywell Inn, introducing us to the ‘Raffle Prize Queen’, centred on the importance of community engagement as part of a Compulsory Purchase Order campaign. The popularity of this discussion showed just how prevalent the issue of Compulsory Purchase Orders is becoming amongst groups looking at trying to purchase their local. 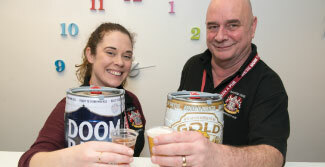 Jenny Sansom (More than a Pub programme Manager, Power to Change) and Chris Cowcher (Head of Community Business, Plunkett Foundation) introduced the ‘More than a Pub 2’ programme, coming to a community near you this summer. With lots of support on offer, there are high hopes that the sector will continue to grow and thrive. Further details can be found here. In the meantime there’s still plenty of support on offer for groups looking to bring pubs into community ownership, and, for existing community pubs there’s fantastic support through the Community Pubs Network , launched by Tasha Bevan (Membership Officer, Plunkett Foundation). Contact us if you’re interested in accessing membership benefits for your community pub group. Feedback that’s followed from the day has been overwhelmingly positive and many welcomed the relaxed feel to the. The only negative to report was that workshops could have been longer! Special thanks to Plunkett staff who worked hard in the lead-up to the event and on the day; funders; speakers and exhibitors; CBA events for their help with bookings and operations on the day; Matt and Dean who filmed and photographed the event and the Studio in Birmingham who were great hosts and caterers. You can find a film of the day on our Films section here.